Barnes - The Gruffalo’s house! 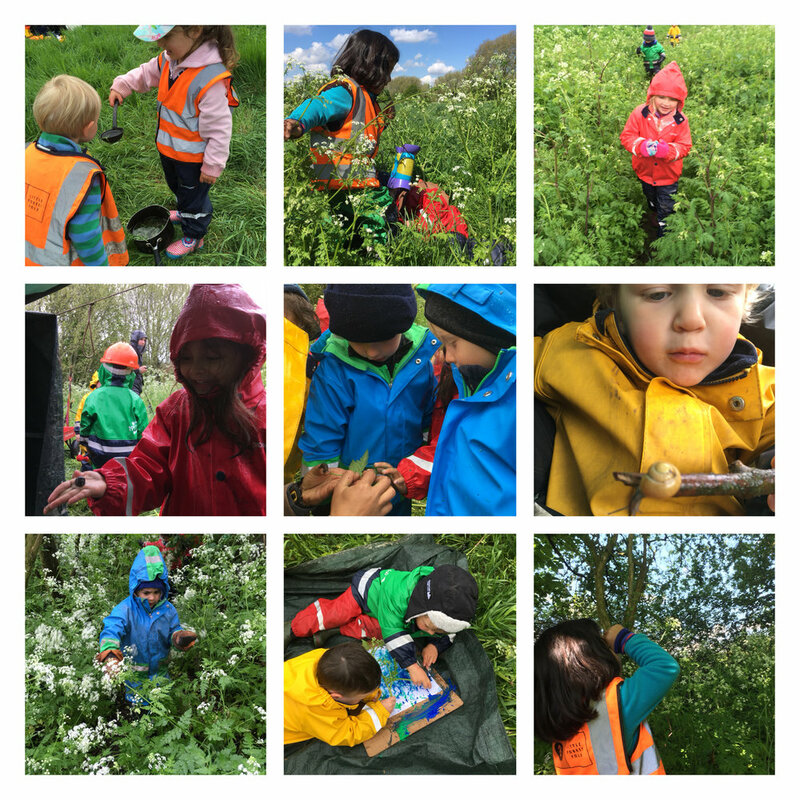 This week in the forest the children have enjoyed a real mix of English spring weather. We have had cold, wind, rain, warmth and sunshine. The children have now begun to notice that the different weather conditions mean that different minibeasts and animals come out at different times! The slugs, snails and worms come out when it is wet and hide when it is dry and the beetles, spiders, caterpillars and butterflies come out when it is sunny and hide when the rain comes. It is lovely to hear the children talk about the possible reasons for it. Some children think that the butterflies only like sun because the it helps make their wings flap and other commented that the snails are wet, so therefore they like the rain! We have also started using some wonderful new sites. One day saw us venture into a jungle of cow parsley nearly six feet high to set up our basecamp! The children made dens and explored this new world as keen explorers on a mission. They worked fantastically well as a team to build and construct a wonderful rocket ship complete with kitchen and bedroom. They made special biscuits that would help them fly to the moon using different coloured natural materials they found on the ground. On another day, a group decided they wanted to go to a secret woodland where the Gruffalo lives. They discussed the best way to move through the thick vegetation without getting hurt or damaging the plants. The children’s creativity really shone. Their ideas included using a stick as a shield, making gloves from dock leaves to keep hands safe and to part the plants. Once in the woods the children engaged in some fantastic role-play as they searched about for the Gruffalo’s house! We hope everyone has a lovely sunny bank holiday weekend and we are looking forward to another exciting week next week.